It seems every time I pick a pair of socks out to put on in the morning, I get them half way on, and all the sudden my fingers go through a giant hole in the bottom of the sock! I just don't know how all these holes happen, but they do and I hate feeling the floor through the holes in my socks! So when I saw that Darn Tough socks are Unconditionally Guaranteed for Life - seriously, no questions asked, I was SOLD and knew those were the socks for me and my husband, who seems to have more holes and go through more socks than I do! Darn Tough socks are All Weather Performance Socks knit made from fine gauge Merino wool and custom blended Coolmax yarns. They offer 6 Series designed to fit the active lifestyle: SKI-RIDE, HIKE-TREK, RUN-BIKE, KIDS, LIFE-STYLE, HUNT-FISH. The Life Style line of socks for everyday use is perfect for around town or a day at work. No other sock combines function and fashion like those made by Darn Tough. Founded by a third-generation sock maker Ric Cabot. Darn Tough is the premium, performance sock of choice for hikers, bikers, runners, hunters, skiers and anyone who knows the difference a good pair of socks makes. I received several pairs of socks for my husband and myself from the Life Style Series. They are perfect for wearing to work, with dress shoes and whenever I want a comfortable, fun, and durable pair of socks! When I first heard they were made from wool and were lifetime guaranteed, I thought they would be extremely thick, hot and hard to put on and wear. That is really the exact opposite of the truth! They are really lightweight, easy to slip on, and airy for a great wear every time! Plus, I love the fun patterns and colors that all the socks come in! I spent a long time looking at all the fun styles and colors! 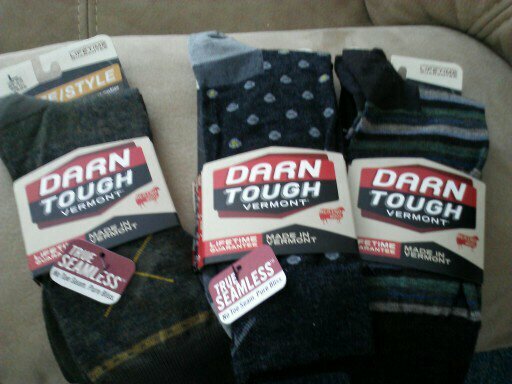 Buy It: You can purchase all Darn Tough socks from a local retailer near you or these online retailers.